Source: Malbourne Angier Bust, Durham. Photo courtesy Donald Burgess Tilley Jr. The likeness of Malbourne A. Angier is sculpted in metal from mid-chest up and rests atop a stone plinth. 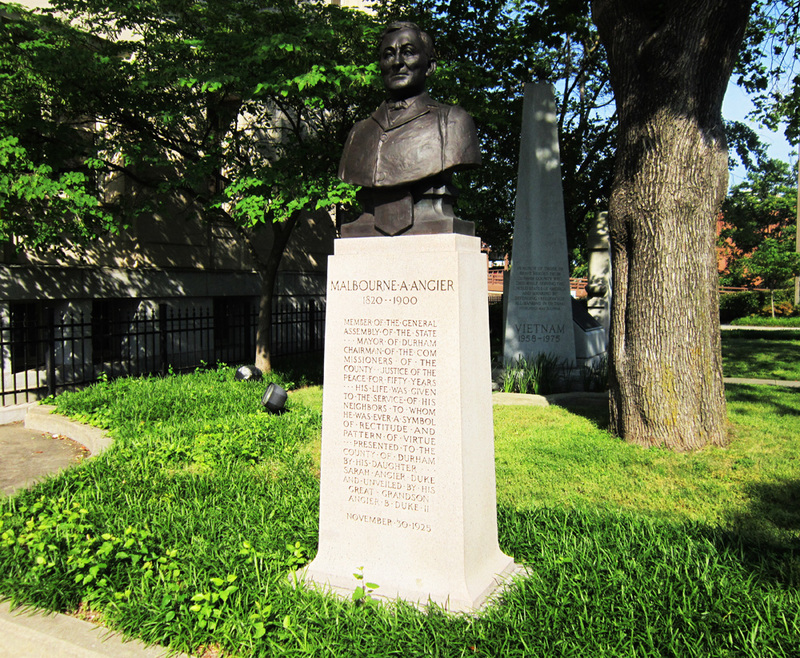 The monument was unveiled by Malbourne A. Angier's great-grandson, Angier B. Duke II on the 105th anniversary of his birth. Several hundred visitors from all over the state attended the occasion, which was held in the superior courtroom at 2:30 pm. A prayer was offered by Rev. J. W. Wellone, centenarian and former pastor of the Christian Church of Durham. W. W. Fuller, a prominent citizen of Durham, spoke at the ceremony. He was introduced by Dr. W. P. Few, the president of Duke University. Both Fuller and Few had been friends of Angier. Durham attorney R. P. Reade accepted the monument on behalf of the city and county. Angier was also known as "Squire." Malbourne Addison Angier (1820-1900) owned much of the land in what is now the Fayetteville Street Historic District. He was a partner of Dr. Bartlett Durham in the town's first general store. During his lifetime, Durham experienced rapid growth, and he participated in many public institutions. According to one source, his willingness to sell land to blacks made the establishment of the Hayti neighborhood possible. 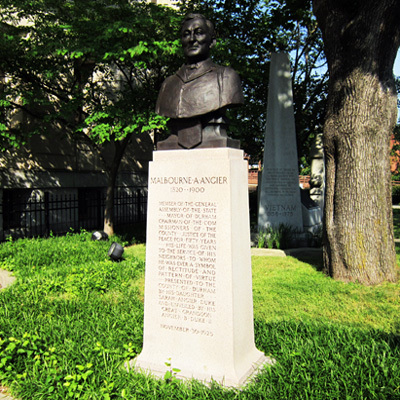 The monument to Angier was the third one placed on the courthouse grounds. Sarah (Pearson) Angier Duke is the namesake of Sarah P. Duke Gardens. The courthouse is part of the Downtown Durham Historic District. The bust is located at 200 East Main Street, Durham, in front of the Old Durham County Courthouse. It stands in a landscaped bed on the northwest side of the courthouse steps, facing southeast. The tree-lined street is complemented by decorative plantings in front of the 1916 limestone courthouse.